Information and Pictures on Pubic Lice (Crabs), a condition usually transmitted through sexual contact. Information includes symptoms, diagnosis, treatment, transmission, prevention and other general information. 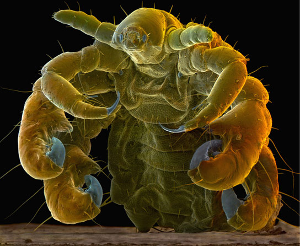 The most common parasites that infect humans are pubic lice (Pediculosis pubis) and head lice (Pediculosis humanus capitis) and mites (Scabies). Pediculosis pubis, commonly named ‘crab lice’ or ‘crabs’ occurs worldwide. Records of crabs date back to the writings of the ancient Greek philosopher, Aristotle. Pubic lice infest areas of the body where hair grows, especially the groin. They are most common in adolescents and young adults. They have occurred at epidemic proportions across all age and socio-economic class groups since the 1960s. An estimated 3 million people with new cases of pubic lice are treated each year in the United States. An adult louse gets onto the skin and lays eggs. They attach their eggs, called nits, to the host’s pubic hair. Eggs hatch 6-10 days later releasing baby lice, called nymphs. Within 15 days these grow into adults and multiply again. Nymphs and adult lice feed on human blood. A louse lives for about 6 weeks but dies within 24 hours without a blood meal. Female lice lay 2-3 eggs daily which are fastened to shafts of body hair. Eggs hatch into nits within a week. They are highly mobile and can crawl several inches in a day. If they fall off the body, they die within 1-2 days. Inflamed skin and small red or bluish irritations caused by ‘crab’ lice bites and defecation. Intense itchiness at the infected area, usually more intense at night. This begins about 5 days after infestation. Avoid close contact with others if you have scabies or pubic lice. Some people do not itch so do not know they are infested. Diagnosis is made with the naked eye, a magnifying glass, or under a microscope, from observation of the shape of the louse and/or eggs. Look like tiny, pale gray crabs. Darken in color when swollen with blood. Display six legs, four of which are crab-like claws used to grasp the hair of the host. If you think you have been exposed to pubic lice or scabies see your doctor or health practitioner immediately to determine whether or not treatment is required. Treatment is with anti-parasite medication. The most effective treatments are shampoos and creams containing Lindane, Permethrin or a related compound. Always follow directions carefully as these chemicals are quite toxic. The infestation may be stubborn, and you may need to repeat the treatment if symptoms continue or recur. Decontamination of all bedding and clothing with hot-water machine washing or dry cleaning is essential to avoid re-infection. Everyone exposed to pubic lice should be treated at the same time. The home should be thoroughly vacuumed. Pregnant and breastfeeding women are advised not to use this drug and to use a product safe for these conditions, such as Rid, a liquid pediculicide, which kills both lice and eggs.Rrecommendations for use in infants and small children should be followed carefully. Lice have been known to spread diseases such as typhus.